If you’re looking for the best set of instructions for how to cook asparagus look no further! The easiest way to cook asparagus is just to boil in water for approximately 10 – 15 minutes and then top with salt, pepper, and butter. 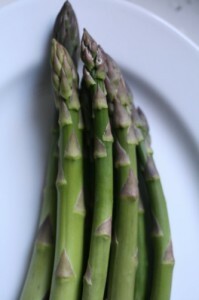 However, if you’d like an easy and exciting new recipe, try Sautéed Garlic Asparagus. It’s a simple and delicious twist on plain asparagus that will be sure to please. This recipe is best prepared with one bundle of fresh asparagus. However, in a pinch, one bag of frozen asparagus that has been previously thawed will work. To prepare, melt three tablespoons of butter in a saucepan over medium to high heat. Add three chopped cloves of garlic and asparagus and sauté for about ten minutes or until desired tenderness making sure to stir occasionally. Asparagus has been described as difficult to pair wines with. However, Sauvignon Blanc, Riesling, and Pinot Gris have been recommended. If pairing asparagus with meat, pair wine according to the meat as well. Asparagus will make a great compliment to most meat dishes. Asparagus has many health benefits as well. It is a good source of vitamin C, providing over 30% of the daily recommended allowance as well as providing 114% of the recommended allowance for vitamin k. It is high in fiber and potassium as well as folate. In addition, one serving only contains forty calories! Enjoy, knowing that you’re eating an extremely healthy dish… Unless, of course, you’re a little too generous with the butter. Definately gonna try them using your method next time tho.